The photographs above are some of the 1875 delegation to Washington, D.C., taken by Frank F. Currier on 13 May 1875 in Omaha, Nebraska. The delegation was on its way to Washington to meet the President to discuss the Black Hills. 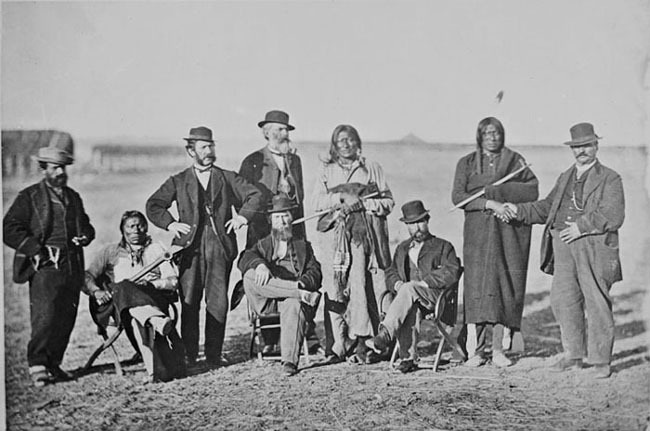 After fighting at the Little Big Horn in June 1876, Young Sitting Bull, like many others, scattered into smaller groups. Then in December 1876, a few warriors that were following Young Sitting Bull, ran off some U.S. 5th Infantry horses from the "Cantonment on the Tongue River", in eastern Montana, recently established by Col. Nelson A. Miles in July 1876, and later called Fort Keogh. Not wanting to provoke a fight in the cold winter, on December 17th, Young Sitting Bull went with Hollow Horns, Fat On The Beef, Lame Red Skirt, Tall Bull and Bull Eagle carrying a white flag, with the peaceful intention of returning the stolen horses. However, Crow Scouts who were hanging around the Fort, ambushed and killed all six of the men before the soldiers at the Fort realized what had happened. WM. S. HARNEY, Brevet Major General U.S.A.
ALFRED H. TERRY, Brevet Major General U.S.A.
TAH-SHUN-KA-CO-QUI-PAH, his + mark, Man Afraid Of His Horses. SHA-TON-SKAH, his + mark, White Hawk. SHA-TON-SAPAH, his + mark, Black Hawk. EGA-MON-TON-KA-SAPAH, his + mark, Black Tiger. OH-WAH-SHE-CHA, his + mark, Bad Wound. PAH-GEE, his + mark, Grass. WAH-NON SAH-CHE-GEH, his + mark, Ghost Heart. COMECH, his + mark, Crow. OH-HE-TE-KAH, his + mark, The Brave. TAH-TON-KAH-HE-YO-TA-KAH, his + mark, Sitting Bull. SHON-KA-OH-WAH-MEN-YE, his + mark, Whirlwind Dog. HA-KAH-KAH-TAH-MIECH, his + mark, Poor Elk. WAM-BU-LEE-WAH-KON, his + mark, Medicine Eagle. CHON-GAH-MA-HE-TO-HANS-KA, his + mark, High Wolf. WAH-SECHUN-TA-SHUN-KAH, his + mark, American Horse. MAH-KAH-MAH-HA-MAK-NEAR, his + mark, Man That Walks Under The Ground. MAH-TO-TOW-PAH, his + mark, Four Bears. MA-TO-WEE-SHA-KTA, his + mark, One That Kills The Bear. OH-TAH-KEE-TOKA-WEE-CHAKTA, his + mark, One That Kills In A Hard Place. TAH-TON-KAH-TA-MIECH, his + mark, The Poor Bull. OH-HUNS-EE-GA-NON-SKEN, his + mark, Mad Shade. SHAH-TON-OH-NAH-OM-MINNE-NE-OH-MINNE, his + mark, Whirling Hawk. MAH-TO-CHUN-KA-OH, his + mark, Bear's Back. CHE-TON-WEE-KOH, his + mark, Fool Hawk. EH-TON-KAH, his + mark, Big Mouth. MA-PAH-CHE-TAH, his + mark, Bad Hand. WAH-KE-YUN-SHAH, his + mark, Red Thunder. WAK-SAH, his + mark, One That Cuts Off. CHAH-NOM-QUI-YAH, his + mark, One That Presents The Pipe. WAH-KE-KE-YAN-PUH-TAH, his + mark, Fire Thunder. MAH-TO-NONK-PAH-ZE, his + mark, Bear With Yellow Ears. CON-REE-TEH-KA, his + mark, The Little Crow. HE-HUP-PAH-TOH, his + mark, The Blue War Club. SHON-KEE-TOH, his + mark, The Blue Horse. WAM-BALLA-OH-CONQUO, his + mark, Quick Eagle. TA-TONKA-SUPPA, his + mark, Black Bull. MOH-TOH-HA-SHE-NA, his + mark, The Bear Hide. OH-PON-AH-TAH-E-MANNE, his + mark, The Elk That Bellows Walking. HEH-HO-LAH-ZEH-CHA-SKAH, his + mark, Young White Bull. WAH-CHAH-CHUM-KAH-COH-KEEPAH, his + mark, One That Is Afraid Of Shield. HE-HON-NE-SHAKTA, his + mark, The Old Owl. MOC-PE-A-TOH, his + mark, Blue Cloud. OH-PONG-GE-LE-SKAH, his + mark, Spotted Elk. TAH-TONK-KA-HON-KE-SCHUE, his + mark, Slow Bull. SHONK-A-NEE-SHAH-SHAH-ATAH-PE, his + mark, The Dog Chief. MA-TO-TAH-TA-TONK-KA, his + mark, Bull Bear. WOM-BEH-LE-TON-KAH, his + mark, The Big Eagle. MATOH, EH-SCHNE-LAH, his + mark, The Lone Bear. MA-TOH-OH-HE-TO-KEH, his + mark, The Brave Bear. EH-CHE-MA-KEH, his + mark, The Runner. TI-KI-YA, his + mark, The Hard. HE-MA-ZA, his + mark, Iron Horn. JAS. C O'CONNOR, WM. D. BROWN, NICHOLAS JANIS, ANTOINE JANIS, Interpreters. MAH-TO-NON-PAH, his + mark, Two Bears. MA-TO-HNA-SKIN-YA, his + mark, Mad Bear. HE-O-PU-ZA, his + mark, Louzy. AH-KE-CHE-TAH-CHE-KA-DAN, his + mark, Little Soldier. MAH-TO-E-TAN-CHAN, his + mark, Chief Bear. CU-WI-TO-WIA, his + mark, Rotten Stomach. SKUN-KA-WE-TKO, his + mark, Fool Dog. ISH-TA-SAP-PAH, his + mark, Black Eye. IH-TAN-CHAN, his + mark, The Chief. I-A-WI-CA-KA, his + mark, The One Who Tells The Truth. AH-KE-CHE-TAH, his + mark, The Soldier. TA-SHI-NA-GI, his + mark, Yellow Robe. NAH-PE-TON-KA, his + mark, Big Hand. CHAN-TEE-WE-KTO, his + mark, Fool Heart. HOH-GAN-SAH-PA, his + mark, Black Catfish. MAH-TO-WAH-KAN, his + mark, Medicine Bear. SHUN-KA-KAN-SHA, his + mark, Red Horse. WAN-RODE, his + mark, The Eagle. CAN-HPI-SA-PA, his + mark, Black Tomahawk. WAR-HE-LE-RE, his + mark, Yellow Eagle. CHA-TON-CHE-CA, his + mark, Small Hawk, or Long Fare. SHU-GER-MON-E-TOO-HA-SKA, his + mark, Fall Wolf. MA-TO-U-TAH-KAH, his + mark, Sitting Bear. HI-HA-CAH-GE-NA-SKENE, his + mark, Mad Elk. LITTLE CHIEF, his + mark. TALL BEAR, his + mark. TOP MAN, his + mark. THE WOUNDED BEAR, his + mark. THE FOX, his + mark. THE DOG BIG MOUTH, his + mark. SPOTTED WOLF, his + mark. SORREL HORSE, his + mark. BLACK COAL, his + mark. BIG WOLF, his + mark. BLACK CROW, his + mark. THE LONE OLD MAN, his + mark. BLACK BULL, his + mark. BIG TRACK, his + mark. THE FOOT, his + mark. BLACK WHITE, his + mark. YELLOW HAIR, his + mark. LITTLE SHIELD, his + mark. BLACK BEAR, his + mark. WOLF MOCASSIN, his + mark. BIG ROBE, his + mark. WOLF CHIEF, his + mark. ROBERT P. MCKIBBIN, Captain 4th Infantry, and Bvt. Lieut. Col. U. S. A., Commanding Fort Laramie. WM. H. POWELL, Brevet Major, Captain 4th Infantry. HENRY W. PATTERSON, Captain 4th Infantry. THEO E. TRUE, Second Lieutenant 4th Infantry. MAH-PI-AH-LU-TAH, his + mark, Red Cloud. WA-KI-AH-WE-CHA-SHAH, his + mark, Thunder Man. MA-ZAH-ZAH-GEH, his + mark, Iron Cane. WA-UMBLE-WHY-WA-KA-TUYAH, his + mark, High Eagle. KO-KE-PAH, his + mark, Man Afraid. WA-KI-AH-WA-KOU-AH, his + mark, Thunder Flying Running. Sitting Bull the Younger, also called Sitting Bull of the South and Sitting Bull the Good - to distinguish him from the Northern, 'Bad' (!) Sitting Bull, was born about 1840 or perhaps a few years earlier, and he was killed Dec. 16, 1876, by Miles's Crow scouts at Tongue River Cantonment (later Ft Keogh). According to contemporary accounts from Red Cloud Agency he was a nephew of Little Wound. That could mean he was the son of one of Little Wound's sisters. In any case he was a grandson of Little Wound's father Bull Bear (killed 1841), the Oglala head chief. In the Walter M. Camp papers at Love Library, University of Indiana, there is a statement that a man named Sitting Bull was the son of Old Man Afraid of His Horse. I'm pretty sure that this is our Sitting Bull, and that one way we could read these statements is that one of Old Man Afraid's 'brothers' was married to one of Bull Bear's 'daughters', and their child was Sitting Bull. In Lakota kinship terms this would work. I'm pretty sure that there must have been a connection to the Man Afraid family. 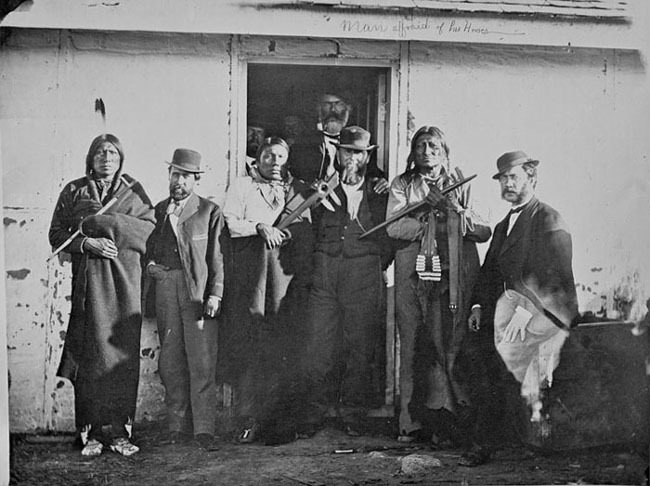 In winter 1873-74 Sitting Bull was listed as one of the headmen in the Kiyaksa band (main chief Little Wound). His sub-band was counted at 21 lodges for rationing purposes. However when Agt Saville started compiling his census in March 1874, he lists the following seven families together as part of the "Piabia" or Payabya band, led by Old Man Afraid. There is more evidence of a Bull Bear relationship here, because Yellow Bull (Tatanka Gi - also translated Brown Bull) was the name of one of Bull Bear's sons. The name got passed down in the family, so at least two men had the name in this period. Henri asked me for some thoughts on Sitting Bull, so here are a few preliminary remarks. More later. 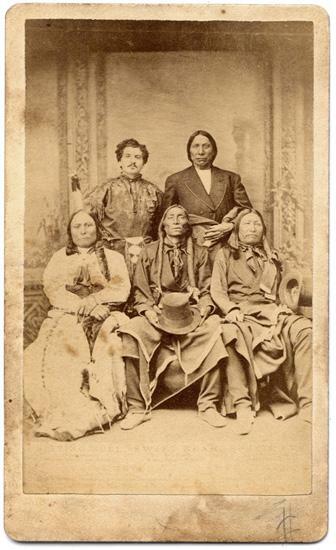 Still looking for more answeres on the Oglala Sitting Bull. My "adopted" Lakota mom, Ms.Edith Wounded Horse, once told me that her grandmother Julia Slow Bull was a sibling of the Oglala SB who died in 1876 when she was ca.2-3 years old. Flying Horse was a brother of SB who accendentally was killed during the Wounded Knee massacre. Like to know if SB had more brothers/sisters ( names ). Did SB had only Julia as his daughter or were there more children in his household? Further I like to know more about Sitting Bull's father/mother. I know he was a granson of Bull Bear and that Little Wound was his uncle. Any info is appreciated and can be forwarded to Ms.Wounded Horse. Hin Tamaheca stated that - Old Man Afraid of His Horses (his name should be more correctly translated as, "his enemies are even afraid of his horse") had 5 sons. They were, Young Man Afraid of His Horses, Clown Horse, Bull Bear, Black Mountain Sheep, and Red Star. So I'm very confused who Sitting Bull's ( Oglala ) father is. I'm not convinced that Old Man is the father untill it is proven correctly. Here a link to Oyate1.proboards to find more info on Old Man and his children. No mentioned of Sitting Bull as far I can see. Hopefully some-one who has the knowledge to sort out the census that makes some clear I'll wait humble. A friend of mine mentioned a book, Tragedy Strikes at Wounded Knee by Will H.Spindler, where in is a chapter of the Oglala Sitting Bull. I got two pages scanned from him and I will quote from it. Eugene Wounded Horse ( uncle of my adopted Lakota mom, Edith Wounded Horse ) recalls that he is the grandson of the Oglala SB. His mother , Mrs.Julia Little is the only living daughter of the Oglala Sitting Bull. Julia was divorced from Joseph Wounded Horse and married afterwards to Miles Little. Julia was only a year old when her father got killed by the Crows in 1876. Then she and her mother were cared for by an uncle and aunt. Julia got the name of Wowape La ( Flag Woman ) because of the good deeds and honors which came to her father. 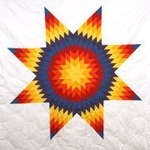 It was given to her on the occasion when Sitting Bull had negociated with a United States representative, after which he was given a flag for his own. What I like to know is...who were the uncle and aunt of her? Can anybody shed a light on this? Looks like your persistence on this question finally came through! Glad you found confirmation of the connection to Sitting Bull (Oglala). In the 1880s-1890s census records at Pine Ridge, it looks like Flag (later Julia Wounded Horse) was living in the family of an elderly woman named Wears the Leaf (born about 1815-18). In some census records, Flag is listed as her daughter; in a few she is listed as a granddaughter. Would it be possible to send me the census record that give these names? Are we sure there was only 1 Oglala Sitting Bull ? Is it possible that there were 2 Oglala Sitting Bulls ? The other called Young Sitting Bull to distinguish between them. Are we sure that all information below apply to the same Oglala Sitting Bull ? 1. Killed by the Crows outside of the Tongue River Cantonment in December 1876. 2. A member of a group who ran off some U.S. Army 5th Infantry horses from Tongue River Cantonment in December 1876. 3. Sitting Bull who struck the Itancan White Bird with the flat side of his club at the council about Black Hills in September 1876. 4. A warrior in the battle at Little Big Horn in June 1876. 5. A member of the 1875 delegation to Washington D.C., to discuss the Black Hills. 6. Sitting Bull on the photographs above from 1875. 7. An appointed leader of the guard for the Red Cloud Agency by agent Saville in April 1874. 8. A signer of the Fort Laramie Treaty in 1868. 9. A nephew of Little Wound in the broad Lakota sense. 10. A member of the Kiyaksa band led by Little Wound. 11. A relative of Old Man Afraid of His Horse in the broad Lakota sense. 12. A member of the Payabya band led by Old Man Afraid of His Horse. 13. Father to Flag Woman (aka. Julia Wounded Horse & Julia Little & Julia Slow Bull). To my eye these photographs are of 2 persons, but not the same person. Person A is on Pictures 1-3. Person B is on pictures 4-5. That would mean 2 Oglala Sitting Bulls. Without Meat or better translated as No Flesh. Amazing, this must have been taken during the 1875 delegation trip of Lakotas to Washington. Looks a little different to the Currier photos posted above... different backdrop, but Sitting Bull seems to wear the same clothes and robe. My hope is that there could be more photos of the 1875 delegation. Didn´t we have the Grey Cloud picture by W.H. Masters somewhere? Is this really No Flesh?